This charming getaway features decor for the world traveler. A palm tree design, featuring deep browns, reds and gold. It has a queen size bed, with sitting chairs for relaxing and enjoying the tranquil views, while drinking a chilled beverage from the mini fridge. Relax and watch T.V. or a movie on the large flat screen. 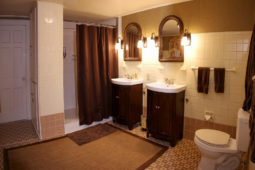 This spacious bathroom features his & hers sinks and large shower. This oasis room will take you out of the world and into paradise. Come relax and get away. This room features a Queen size bed, double sheeted with ultra-soft cotton sheets and plenty of fluffy pillows.